It’s been a tough winter for those with sleds in the shed. 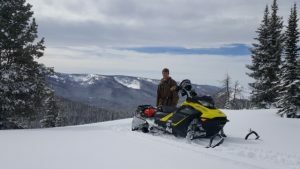 From the time he was 16, Brandon Shelton has looked forward to spending winter days snowmobiling across the wide-open fields of North Central Iowa. This year he’s had to get his fix by traveling to the Sierra Madre range in South Central Wyoming and to the Teton range in western Wyoming. Brandon also been staying busy this winter by putting the finishing touches on his 2019 crop plan and counting down the days until spring. 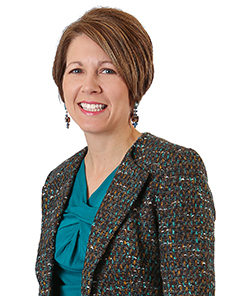 “What I enjoy most about farming is the strategy involved. I like deciding what equipment needs to be moved and when during planting and harvest. I also like planning inputs and developing the recipe that will give our crops what they need to perform their best. I’m always looking for ways to use anhydrous more efficiently,” says Brandon. Some farmers put their equipment in the shed and take a break until it gets closer to the planting season. Not Brandon. He’s been working since he was 12, and he worked 40 hours a week when he was attending Iowa State University. 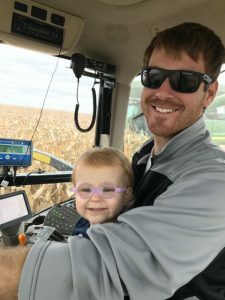 Brandon hadn’t planned to farm with his dad immediately upon his college graduation, but the opportunity presented itself. Brandon’s dad, Britt, was raising seed corn and needed help. Brandon always knew he wanted to farm, so the timing worked out well. He’s since taken on a Latham® dealership. Once the seed is in the ground, Brandon enjoys spending time with his family at the lake. 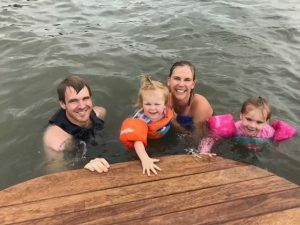 His parents have decided to retire on Lake Panorama, so that’s where the Shelton family gathers as often as possible. Brandon’s brother, Weston, and his fiancé, Lauren, travel from Chicago for holidays. The Fourth of July is spent boating during the day and watching fireworks from the boat at night. Brandon also enjoys skiing barefoot and his dad likes to slalom ski. Brandon’s kids are at the age where they love to play in the sand and get their toes in the water. They love to surf behind the boat with their dad and swim as often as they can. Brandon and his wife, Nicole, are the proud parents of two daughters, five-year-old Madeline and three-year-old Lahna. They’re expecting their third child in June. Brandon and Nicole met at Iowa State where he majored in Agronomy and Ag Studies while she studied Early Childhood Education. On summer nights, Brandon and Nicole enjoy taking date nights in his 1973 Corvette. Owning this car has been a dream come true for Brandon. He spent weekends during his high school years, hanging out in the auto shop owned his buddy’s dad. The two teens enjoyed working on the car and getting it ready for the next car show. When his buddy’s dad decided to sell the car, Brandon went to the bank for a loan. He then went to the body shop, with check in hand, only to discover his dad had already bought the car. Brandon and his dad share a passion for old cars, farming and water skiing. But Brandon says his sense of adventure was fueled by his mother, Pam, who planned trips for bank patrons. As a kid, Brandon traveled with Pam and was “bitten by the travel bug.” One of the places he enjoyed visiting the most was the Arenal Volcano Park in Costa Rica. Brandon enjoyed birding in the rain forest, as well as enjoying the hot springs pools. Another memorable trip for Brandon was a 20-day study abroad to Ghana while he was a student at ISU. Brandon’s Soils professor, Dr. Andrew Manu was a Ghana native, so he hosted the trip to teach students about his homeland. Brandon learned that Cassava is the staple crop in Ghana. While he was there, the country was just getting into biofuels. There was a lot of research going into a new crop called Jatropha, which is an oilseed crop that villages were using to make biodiesel. This allowed a small village to run a diesel generator and produce electricity for its residents. Although Brandon enjoys seeing new places and learning about other cultures, there’s no place like home. Today Brandon is sharing with us one of his family’s favorite recipes for baked chicken penne. Preheat oven to 350 degrees. Spray a 9x13 casserole dish. On the stove use a large pan/skillet to melt butter; add onion and garlic. Cook until onions become translucent. Add flour, stir rapidly while doing this. Then add milk, diced tomatoes and tomato sauce. Simmer on low for 7 to 8 minutes. Stir in chicken, ½ of the mozzarella, salt and pepper. Mix everything well and the transfer into 9x13 pan. Bake (uncovered) for 20 to 30 minutes.